Al Stokie found an adult Buff-breasted Sandpiper at Montrose Beach this morning, July 27. Al first saw the bird near the fence at the west end of the protected area. He said the bird flew off after a few minutes and I thought I wouldn’t get to see it but it magically reappeared in front of us while we were standing at the base of the fishhook pier. This was about 7:20. A Killdeer spooked the bird and it flew off to the west and wasn’t seen again. 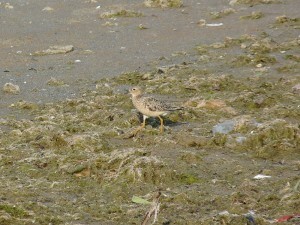 This is the first Buff-breasted Sandpiper I’ve heard of not only for Illinois but the upper Midwest. 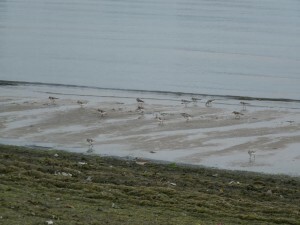 There were also Semipalmated and Least Sandpipers, Sanderlings, and Semipalmated Plovers on the beach. 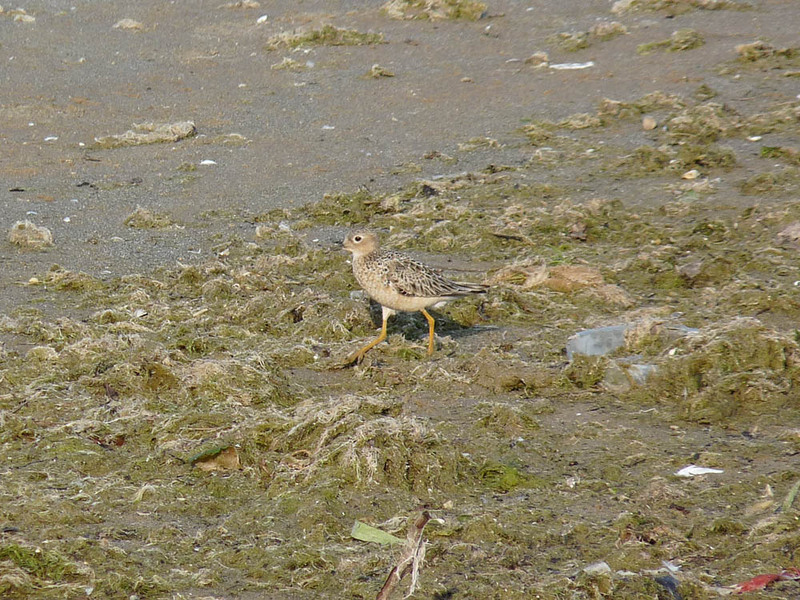 This entry was posted in Summer Bird Reports and tagged Buff-breasted Sandpiper, Shorebirds on July 27, 2014 by rhughes. On April 19 Karen and I birded Sandia Crest, at 10,678 feet the highest point in the Sandia Mountains of northern New Mexico. We were joined by Albuquerque resident and fellow birder Carol Davis, who was kind enough to guide us up and down the mountain. Birders know Sandia Crest as one of the most reliable places in North America to see all 3 species of Rosy-Finch in winter. We were about a month late for Rosy-Finches but we had a great time anyway, and the view of Albuquerque from the top is nothing short of spectacular. Most of the birds we saw were typical Rocky Mountain species – Mountain Chickadees, Steller’s Jays, Broad-tailed Hummingbirds, Red-naped Sapsuckers, “Gray-headed” Dark-eyed Juncos, and “Audubon’s” Yellow-rumped Warblers. We also saw our first Grace’s and Black-throated Gray Warblers of the trip. 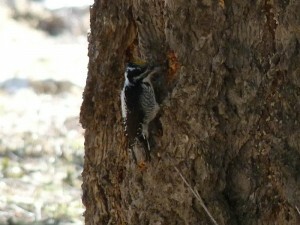 The highlight however were the 3-4 American Three-toed Woodpeckers near the summit. I’ve only seen American Three-toed Woodpeckers twice before so it was a treat to see and hear so many in such a short period. One bird was exceptionally cooperative, almost tame, and let us approach to within a few yards. The American Three-toed Woodpeckers that occur in the Rockies belong to the Dorsalis subspecies, which has a solid white stripe down the back instead of the barred back of eastern American Three-toeds. After Sandia we started driving south through central New Mexico. I’ve only birded the edges of New Mexico before but on this trip we were driving the length of the state from north to south, right through the heart of it. Like Colorado, New Mexico wasn’t short-changed when it comes to scenic beauty. Bosque Del Apache National Wildlife Refuge is located along the Rio Grande River in central New Mexico and is known for its wintering Sandhill Cranes and Snow Geese. We were too late for the cranes and geese but the pools inside the refuge held numerous waterfowl, including Northern Shovelers, Blue-winged and Cinnamon Teal, Gadwall, Lesser Scaup, and Ring-necked Ducks. The water level in the pools was too high for shorebirds but we did have a few American Avocets, Wilson’s Phalaropes, and White-faced Ibises. The diversity of flycatchers on our trip increased dramatically at Bosque. Through Colorado and into northern New Mexico the flycatchers were limited to Say’s Phoebes and a Black Phoebe or two. At Bosque we started seeing Western Kingbirds in numbers, and our first Ash-throated and Vermilion Flycatchers of the trip. More Say’s and Black Phoebes too. There were also raptors, mostly Swainson’s Hawks and Northern Harriers, and a bonus Golden Eagle. The feeders at the refuge headquarters were full of White-crowned Sparrows. Our last major stop on our way south through New Mexico was Percha Dam State Park. 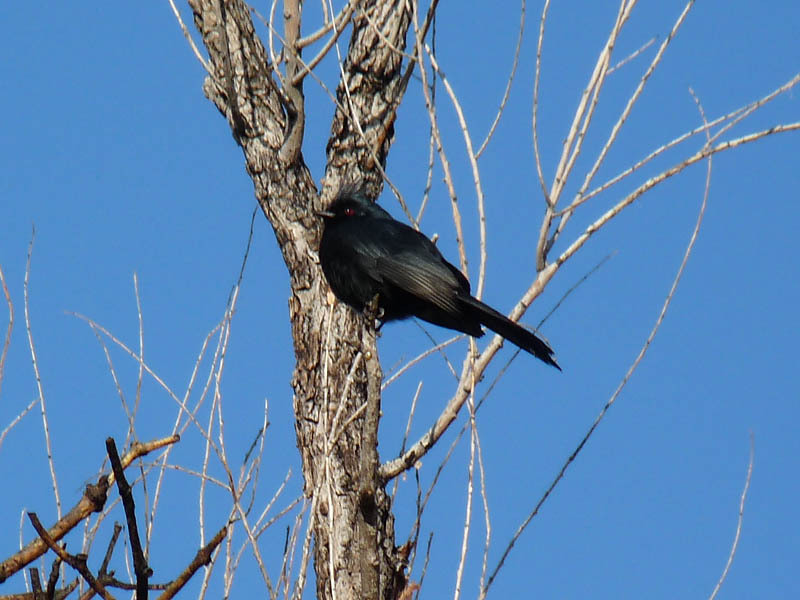 I read about Percha Dam State Park in the “New Mexico Bird Finding Guide”, and Carol Davis, our guide at Sandia, talked (and raved) about the place. Percha Dam State Park is located along the Rio Grande River in southern New Mexico between Truth or Consequences and Las Cruces. What makes it so special from a birding perspective is its lush riparian woodland and undergrowth, a habitat that has become rare along the Rio Grande in southern New Mexico. As such Percha acts as a migrant trap and oasis. It was full of activity when we birded it on the morning of April 20. We had numerous White-crowned Sparrows, a few White-throated and Lark Sparrows, Summer Tanagers, Bullock’s Orioles, a Blue Grosbeak, Wilson’s, Lucy’s, “Audubon’s” Yellow-rumped Warblers, Bewick’s Wrens, our only Phainopepla of the entire trip, and our first Verdin. Flycatchers were well represented too, with numerous Western Kingbirds, a few Vermilion and Ash-throated Flycatchers, and Say’s and Black Phoebes. The Rio Grande at this point is reduced to a few isolated pools of water but these pools had Northern Shovelers, Cinnamon and Blue winged Teal, Gadwall, and what seemed like an out of place Willet. We also had Gambel’s Quails and White-faced Ibises flying overhead. This entry was posted in Non-Montrose Birding on July 12, 2014 by rhughes. 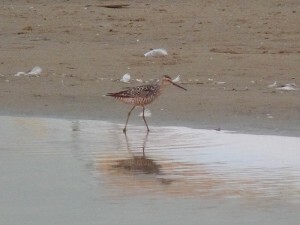 I had an adult Stilt Sandpiper at Montrose Beach this morning. 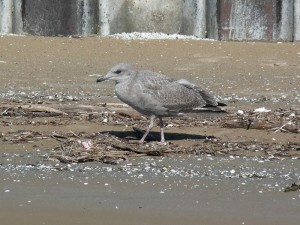 The bird was in the small fluddle between the west end of the protected area and the plastic boardwalk. It flew off when I first saw it but came back after a few minutes. Stilt Sandpipers are fairly rare at Montrose, and we don’t often see them on the beach. Other than the Stilt San I saw nothing else of note and I had to leave early because of the rain. 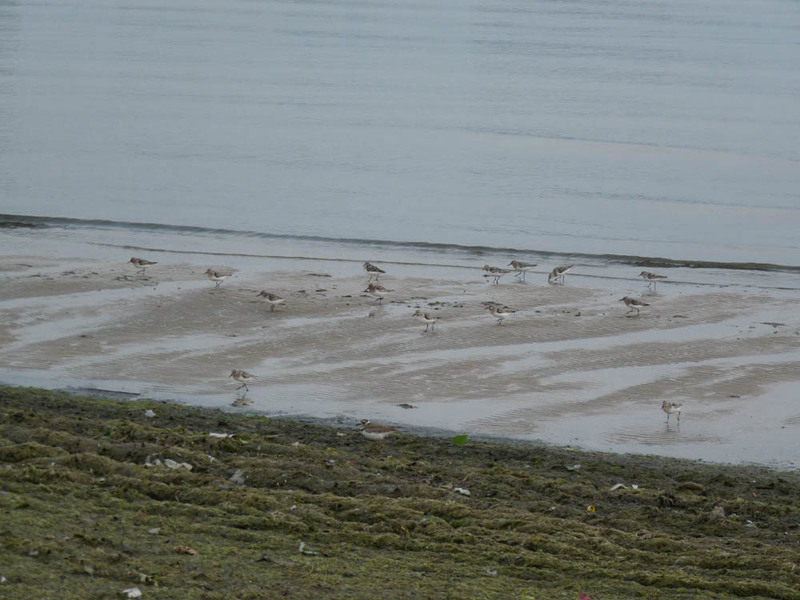 A cold front will move through northern Illinois early next week and there could be shorebirds moving ahead of it; Montrose Beach might be worth checking later today and tomorrow. 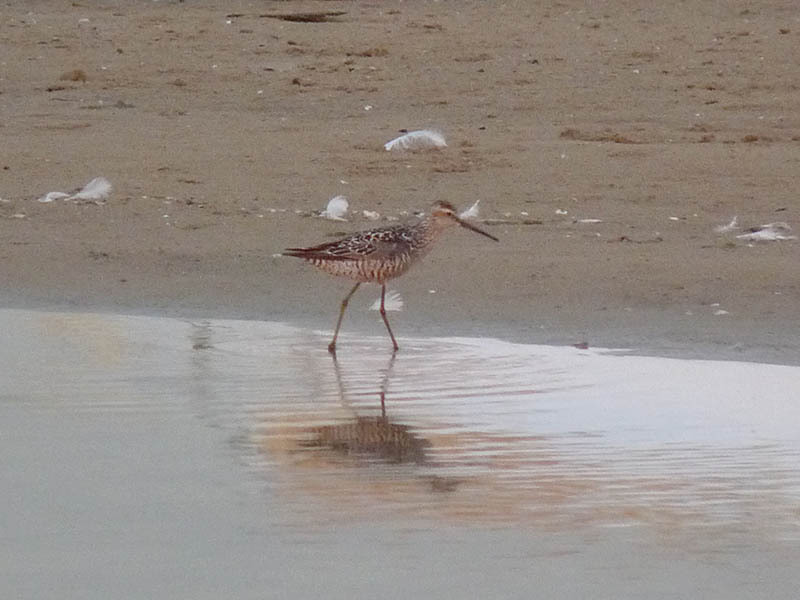 This entry was posted in Summer Bird Reports and tagged Shorebirds, Stilt Sandpiper on July 12, 2014 by rhughes. An immature Common Tern was at Montrose Beach on July 2 and 3. 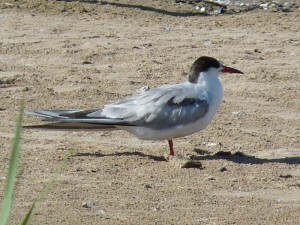 The bird is probably in its second calendar year and can be identified as a Common Tern by the dark feathering on the leading edge of the inner wing (the so-called carpal bar) and the dark red base to the bill. Common Terns are very unusual at Montrose at this time of the year. This entry was posted in Summer Bird Reports and tagged Common Tern, Terns on July 4, 2014 by rhughes. 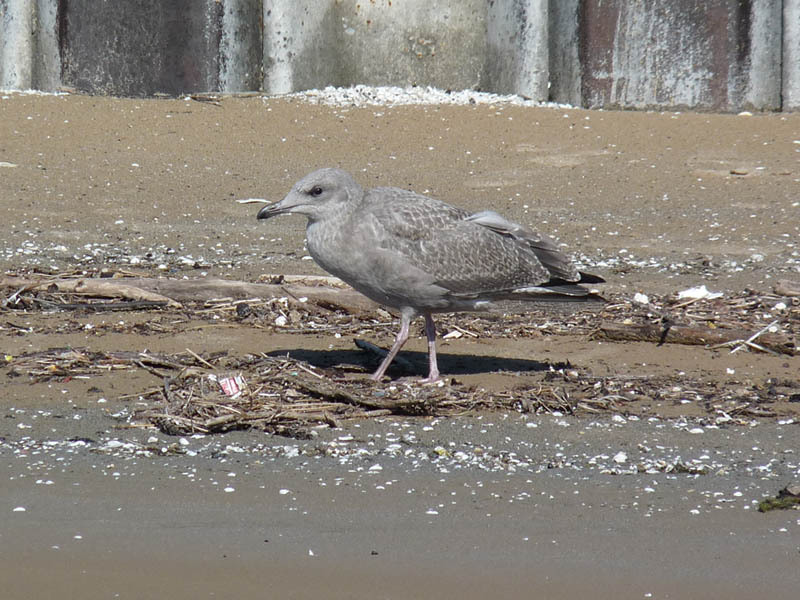 I had a juvenile Herring Gull at Montrose Beach today. This is the first juvenile Herring Gull I’ve seen this year. They usually start appearing in mid July so this is a little early. The bird’s primaries weren’t fully grown, giving it a chopped off look at the rear. This entry was posted in Summer Bird Reports and tagged Gulls on July 4, 2014 by rhughes.